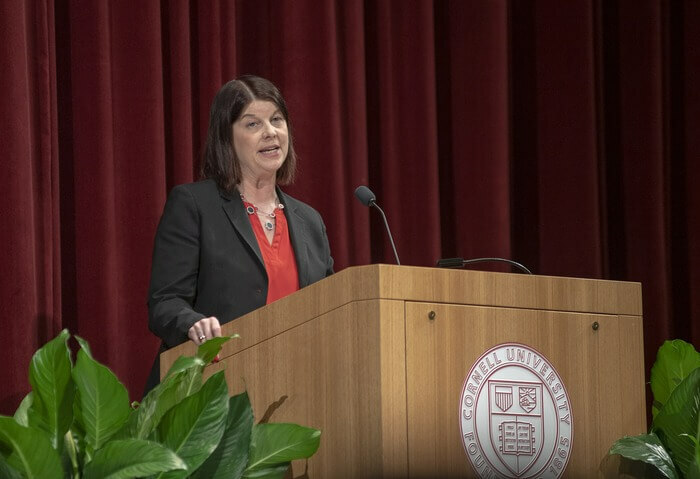 NIU President Lisa Freeman was invited back to her alma mater, Cornell University, Saturday, March 16, to address veterinary students about to begin their clinical rotations. The event, known as the White Coat Ceremony, is a rite of passage for third-year veterinary students meant to instill in them the importance of professionalism, humanity, respect and empathy in the practice of medicine. Freeman joins a long list of distinguished alumni who have been asked to deliver the keynote address at the event. A 1986 graduate of the Cornell College of Veterinary Medicine, Freeman offered herself as an example of how skills learned in veterinary school can open many pathways. She told how she entered college with a passion for caring for animals, discovered a love of discovery science and ultimately earned not just her doctorate in veterinary medicine, but also a Ph.D. degree in pharmacology. She then earned distinction for her teaching in the latter field and oversaw a research lab, which revealed her knack for bringing together people, money and ideas to support students and faculty. All of that led her into a career in university administration which ultimately brought her to her current position leading NIU. Freeman encouraged the students to take to heart the message of the day, noting that the rite of passage being observed was a privileged earned rather than an entitlement. “Today, when you put on the symbolic white coat, you will look and feel different to others – and to yourselves,” she said. “I urge you to wear your white coat proudly – to act always with professionalism, compassion and empathy – to love what you do – and to value and respect each other” Freeman said.